Kobe Bryant recently changed his twitter avatar to a simple image of the numbers “1225,” an obvious nod to ESPN’s respective predictions for the Lakers performance in the West and Kobe’s performance this season in comparison to his NBA counterparts. He, along with Laker Nation, was appalled to see both ranked so poorly. The NBA Rank methodology may be a bit primitive, with each voter voting on a 1-10 integer scale to rate all the NBA players on the list, but the ranking nonetheless reflects a reality that Kobe is likely to regress after rupturing his Achilles tendon. But how much will he regress? Dr. Douglas Cerynik and Dr. Nirav H. Amin of Drexel University did some research into Achilles ruptures in their paper Performance Outcomes After Repair of Complete Achilles Tendon Ruptures in National Basketball Association Players, and shed some light as to just how difficult it is to come back from an Achilles tear. Of the 18 players they looked at, 7 were never able to return to NBA action, 3 returned for just one season, and the remaining 8 would go on to play 2 or more seasons. And of those players that did return, their performance suffered drastically, especially in their first season back. In their study of the 11 players that returned to the NBA, the players PER (player efficiency rating), decreased by an average of 4.57 points. In the second, it decreased by 4.38 points. Even after controlling for age and other confounding variables, both figures were statistically significant, the first with a p-value of .038 and the second with a p-value of .081. If you are unfamiliar with PER, it is an attempt at an all-encompassing rating system that sets the league average at 15. An All-Star typically has a PER in the range of 21 or above, and an MVP will be in the 27-30 range. Last year, Kobe had a PER of 23.10. If his PER fell by the mean decrease seen in the study of 4.57 in 2013-14, it would be 18.53, or .07 points worse than Samuel Dalembert’s PER last year. When Kobe is compared to the mediocre center the Mavericks just signed as a stopgap to please the fan base in Dallas, he suddenly doesn’t seem so intimidating. PER is a flawed metric and isn’t capable of completely representing a player’s all-around contributions, but of those statistics that are publicly available, it’s a pretty good approximator. Even though simply marking Kobe down for a decrease equal to the mean decrease over the last two decades is a bit simplistic, it gives us a pretty good idea of just how much of an uphill climb he’s facing. On top of that, the players returning from injury saw their minutes decrease in their first season by over five minutes per game, a big decrease for a group that had averaged 25.5 minutes per game their two seasons before the injury. Kobe played over 38 minutes per game last year, and expects to carry a similar workload this year, but that expectation has to be seen as extremely unlikely in the context of this study. On the other hand, there were a few bits of positive news for Lakers fans in the study. 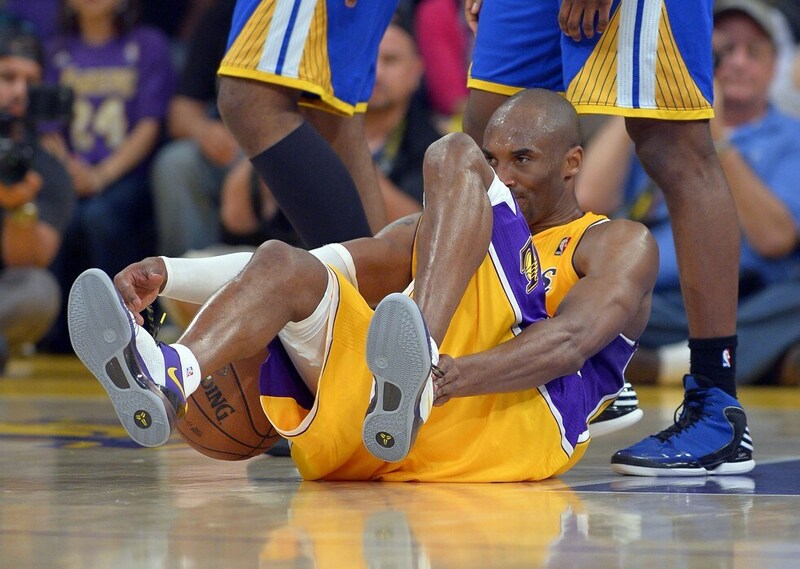 Many have pointed to Bryant’s age as a reason to discount his ability to come back from an injury like this, but the study found no statically significant correlation between age and likelihood of returning from the injury. In fact, the only statistically significant factor on the likelihood of returning from a ruptured Achilles’ was the PER over the last two seasons. Kobe’s PER of 22.5 the last two seasons would rank near the very top of their data in terms of performance, and seems to indicate that he has a very good chance of playing at least two more seasons. Still, the outlook for a banner season from Kobe seems grim. If you decreased his PER by the average reduction of 4.57 as we did above, you’d find that Kobe would’ve ranked 49th in the league last year, some 24 spots higher than where ESPN has him in their NBA Rank. Kobe is an animal and I have little doubt that he will play basketball at a high level again, but the stats indicate that the anger towards his NBA Rank of 25 is far from justified. Reblogged this on Trending Topic : Stefan Vaughan. Next Next post: Who’s Your Quarterback?